I love reading nonfiction. But, as I am sure you can relate, I only have limited time. Even if we were able to make enough time to read one book a week on average—certainly not the case for me right now—we would still only be able to read around 3,000 books in our entire adult lives. At my current pace, the real number will likely end up being far lower. With this in mind, I want to spend my time reading good books! But how can we identify those, without first reading them? Today I want to share my heuristics for choosing good nonfiction books to read. I will also evaluate them against the books I have read in recent years, to see if they generally match up with my ratings. In Challenge 5 of the 2018 Tuenti Challenge, we are given DNA strands (strings containing a mix of aAcCgGtT), and asked to find how we can recombine the strands into two matching sequences. Not all of the strands need to be in the final identical sequences. For example, given the input aacc GgTTC aaccG gTTC aaaa cccc gttc, we need to discover that the sequence aaccGgTTC can be built twice: aacc+GgTTC and aaccG+gTTC. We then return the positions of the parts we used to create the two identical sequences, in this case 1, 2, 3 and 4. This is an interesting problem, and I encourage you to take a few minutes to think about how you would solve this before reading on. The maximum number of parts (18) combined with the time constraints rule out the option of enumerating all the possible combinations of parts. We need to find a slightly more efficient algorihtm. Go 1.9, released in August 2017, introduced the maths/bits package. This package provides optimized functions for bit counting and manipulation of unsigned integers. These are useful in low-level environments where the individual bits stored in an integer are of importance. Let’s take a look at some of the functions. First up, Len returns the minimum number of bits required to represent a value x. This is because 31 is 11111 in binary, and 32 is 100000. The first significant bit is in each case is in position 5 and 6, respectively, when counting positions from the right. When news broke that React Native was open sourced on Friday, I felt elated. This was the moment I had been waiting for. Ever since the React.js conference videos introduced React Native in late January, I couldn’t wait to get my hands on it. Something I often hear new Go developers say is that they are looking for some good projects to study, learn from and contribute to. Normally I suggest reading the Go source: it’s easy to read, you can pick a part you are interested in, and is probably bound to be the best example of idiomatic Go. But this past weekend presented itself with an opportunity to find more open source Go projects that are of the highest quality. I participated in Gopher Gala, a 48 hour-long worldwide hackathon for Go. Our team built a project called Go Report Card, and it aims to rate the quality of any open source Go project on Github. The tool uses various other Go tools: gofmt -s to judge basic formatting, go vet to check for suspicious constructs, gocyclo to measure the cyclomatic complexity of the code, and so on. It then averages these results to get the final grade. I first discovered regular expression crosswords two weeks ago, when RegexCrossword.com appeared on the Hacker News front page. I thoroughly enjoyed the nerdy 30 minutes I spent doing the puzzles, but soon enough my natural inclination towards making computers do my hard work got the better of me: I wanted to solve this with code. This morning I had some free time and decided to give it a shot. It was perhaps even more fun, and definitely more exciting, than solving the puzzles by hand! The end result is about 150 lines of Go code that solves most puzzles in only a few milliseconds. By showing you how I solved it, I hope you’ll learn some interesting things about solving puzzles programatically, how regular expressions work and specifically, how they work in Go. Let’s dive in. There are two test options that make testing in Go especially powerful: one is -cover, which generates test coverage reports, and the other is -race, which warns of possible race conditions in your code. If you haven’t used them yet, you should. They are very useful tools, and both are covered well (so to speak) by official blog posts: The cover story and Introducing the Race Detector. In this article I investigate the computational performance of various string concatenation methods in the Go programming language. Golang’s popularity as a search term might be growing faster than bamboo in springtime, but it’s still dwarfed by the massive overgrowth that is the Java programming language. 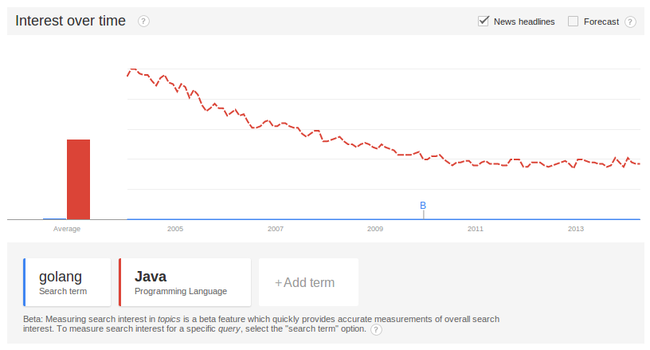 But interestingly, we can see in the graph how dramatically Java’s popularity has fallen in recent years. 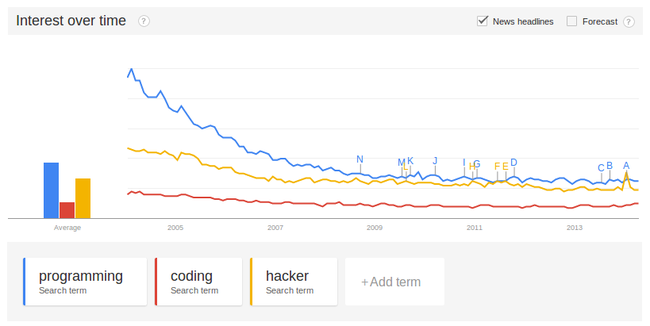 Maybe it has something to do with the worrying decline in programming interest? Hmm. Not sure what to make of that, considering my career choices. Anyway, while Go’s popularity is on the rise, it’s worth pondering whether it will ever grow to the heights that Java once enjoyed. It doesn’t look likely to happen any time soon.